I had an amazing day yesterday and wished I could have posted about it last night but I was too exhausted to type. I got up early to mix up some bread dough for my family. I'd made 10 loaves on Thursday and Friday for the market and my children are always a little unhappy as that bread bakes and they know it is not for them. Now we have two loaves for the week. While I had the flour out I made a pan of Butterscotch Brownies-this is an old recipe that I love and you make it on the stove and then bake it-super easy. While the brownies were in the oven and the dough was rising I helped Groovy Girl get ready for her figure skating lesson at 9. I dropped her at the arena and headed back home to make several batches of pesto for my freezer. Don't worry my husband picked her up after lessons were over! My mom and I worked together, using the recipe from Everyday Italian by Giada DeLaurentis, and made five batches of pesto using fresh basil from her garden and the little I had left from my own. The temperature is beginning to dip down at night and rather than have the basil freeze in the garden I want it to freeze in my Sub-Zero. In a blender (I use the food processor), pulse the basil, nuts, garlic, salt and pepper until finely chopped. With the blender still running, gradually add enough olive oil to form a smooth and thick consistency. Transfer the pesto to a medium bowl and stir in the cheese. Season the pesto with more salt and pepper, if it needs it. The pesto can be made up to 2 days ahead. Cover and refrigerate. **If you are going to freeze your pesto for the long winter months as I did then skip the cheese step and don't add as much olive oil. Later when you grab it out of the freezer to use it you will add in the cheese and a little olive oil to your pasta. Good Parmesan does not freeze well in the pesto. Giada has a note following the recipe that shares her secret of using pasta water to help blend the pesto so it doesn't glob up your pasta. The trick is in saving a little of the pasta water back when draining your pasta. I generally just take a large measuring cup and scoop out about a cup before I drain the pasta and before I add the pasta back to the pot I put the pesto in the pan to soften it up and then add small amounts of water as I mix the pasta into the pesto. Viola; fabulous dinner! My mom bought these handy little Tupperware freezer containers that stack perfectly. Pine nuts are ridiculously expensive right now but we did use pine nuts for these batches. I have a spinach pesto I want to try from the same cookbook and I'm going to substitute walnuts for pine nuts, just to give it a try. I am so happy to have this accomplished as I did not can pickles or make salsa this year. When the snow starts to fly I will be ecstatic to pull out this freshly frozen treat, reminding me of the Spring to come. 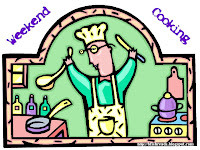 Weekend Cooking is hosted by Candace at Beth Fish Reads. Pop over and see what she and other's are cooking up! I whispered this new bit of information to Teenage Boy and he was ANNOYED. Thankfully, everyone else, including my husband, was a bit more understanding. Luckily we quickly rounded up someone to get us back to point B so we could get keys and canoe trailer. The coolest part of the day was when a friend pointed out a young eagle in a tall, bare tree. We floated right under it. It was a glorious sight.